[5/30/2015 6:08:30 PM] Thuan Thi Do: Diagram XL is an attempt to illustrate these somewhat complex correspondences and relationships. 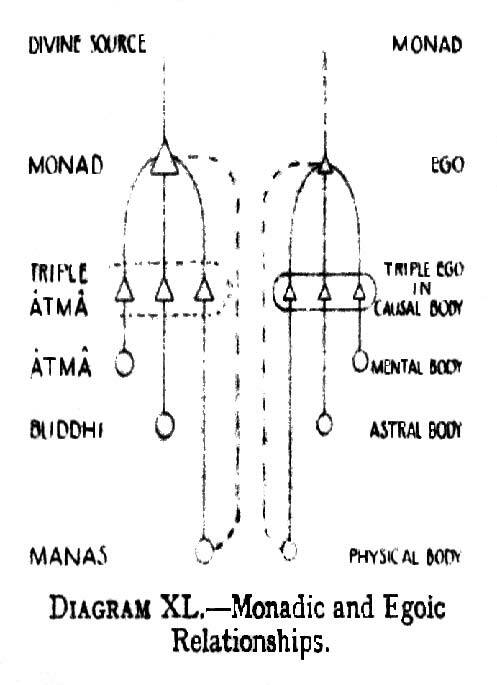 The entire higher triad, atma-buddhi-manas, may also be regarded as the buddhi of the still more inclusive triad of Monad, Ego and Personality. That larger buddhi is triple - will , wisdom and activity—and its third aspect, Kriyashakti, in due course comes into operation in the body, to awaken its organs and liberate its latent powers. guides, and one cannot ( Page 300 ) do other than follow them. But even as guides they are themselves unfolding. We may note here that the triple manifestations of the Monad is that which Christianity speaks of as the "three persons in one God," teaching, in the Athanasian creed, that men should worship "One God in Trinity and Trinity in Unity, neither confounding the persons nor dividing the substance"---that is to say, never confusing the work and function of the three separate manifestations, each on its own plane, yet never for a moment forgetting the eternal unity of the "substance" that which lives behind all alike, on the highest plane, where these three are one. Such considerations are not merely of theoretical value, but have also some practical bearing on life. Although we cannot grasp the full meaning of such teaching ,yet we should at least know that there are these three lines of force and yet that all the force is one and the same. Without knowing that, we cannot grasp the method by which our world came into existence, nor can we understand man, whom "God made in His own image," and who therefore is also three and yet one - atmabuddhi-manas, and yet one Spirit. We may regard the three parts of the higher self as three aspects of a great consciousness or mind.They are all three modes of cognition. Âtma is not the Self, but is this consciousness knowing the Self. Buddhi is this consciousness, knowing the life in the forms, by its own direct perception. Manas is the same consciousness looking out upon the world of objects. Kama-Manas is a portion of the last, immersed in that world, and affected by it. The true self is the Monad, whose life is something greater than consciousness, which is the life of this complete mind, the Higher Self. The same truth may be expressed in a slightly different form—indeed in many forms. Âtma, Buddhiand Manas in man reflect in their smaller spheres the characteristics of the great Trinity. Âtma is the consciousness of self, and also the will, which gives ( Page 301 )self-direction. Manas, at the other pole, is consciousness of the world, and its thought power does all our work, even that which is effected through the hands. But buddhi, between the two, is the very essence of consciousness, of subjectivity. Beyond this middle member, triple in character, is the Monad in man,representative of HimParabrahman, the state of his true and absolute nirvana, beyond consciousness. The Âtma is the state of his false and relative nirvana, of the nirvanic or atmic plane, his last illusion, that persists between the Fourth [Arhat] and Fifth [Adept] Initiations. As the Monad lies above the trinity of consciousness, so the personal bodies lie outside or beneath it - they are known only in reflection in manas. We may perhaps presume - though here we are going far beyond actual knowledge - that when we have finally and fully realised that the Monad is the true man, we shall find, beyond that again, a yet further and more glorious extension. We shall find that the Spark has never been separated from the Fire, but that, as the ego stands behind the personality, as the Monad stands behind the ego, so a Planetary Angel stands behind the Monad, and the Solar Deity Himself stands behind the Planetary Angel. Perhaps, even further still, it may be that, in some way infinitely higher, and so at present utterly incomprehensible, a greater Deity stands behind the Solar Deity, and behind even that, through many stages, there must rest the Supreme over all. But here even thought fails us, and silence is the only true reverence. In the average man the Monad is, of course, but little in touch with the ego and the lower personality, although both of these are yet somehow expressions of him .Just as it is evolution for the personality to learn to express the ego more fully, so it is evolution for the ego to learn to express the Monad more fully. And just as the ego in time learns to control and dominate the personality, so the Monad, in his turn, learns to dominate the ego. [5/30/2015 6:46:15 PM] Thuan Thi Do: At the left-hand side of the diagram, we see the ego represented as very small : he is just a baby ego : complete, but small and undeveloped: the personality is also slender, indicating its primitive condition. As evolution proceeds, the personality gradually widens out, until eventually it becomes equilateral, indicating that it is well developed, all-round, symmetrical. Also, it will be observed, the link between the personality and the ego, at first very narrow, has widened out, until it becomes almost as wide as the full width of the personality. Whilst this has been going on, at the same time, the ego has been steadily growing in size, and the channel between him and the Monad has also been steadily increasing in width. 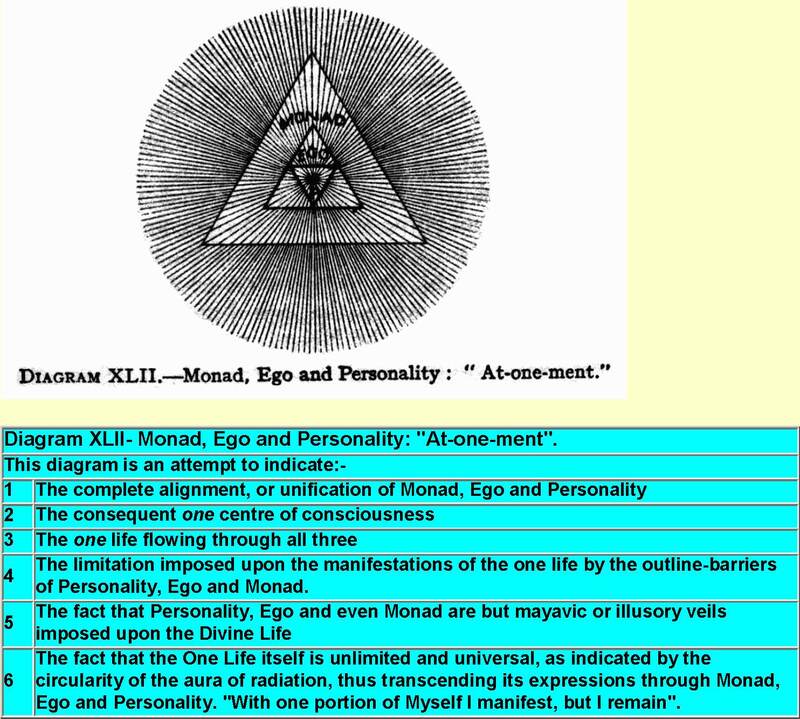 Thus, at the right-hand side of the diagram, we have a strong and wide channel between the Monad and Ego, the Ego himself being fully developed, exercising, through a wide and well-developed link, full control over a symmetrically developed personality. Finally, the time will come when, just as the personality and ego have become one, the Monad and ego also become one. This is the unification of the ego with the Monad, and when that is achieved the man has attained ( Page 303 ) the object of his descent into matter, he has become the Superman, the Adept. [5/30/2015 7:05:21 PM] Thuan Thi Do: Diagram XLII illustrates this consummation. Here we see the Monad, Ego and Personality in perfect alignment, veritably an "at-one-ment" The same life permeates all three of its manifestations, but the personality, owing to its size and its constitution, is able to express less of the one life than the ego is able to do, and the ego, in his turn , for similar reasons, is able to express less than can the Monad. Even the Monad cannot confine, contain, or express the whole of the divine life which radiates out from and beyond that veil, however thin, of separative matter - which makes him a distinct being. When this consummation is reached, then only, for the first time, does the entity enter upon ( Page 304 ) his real life, for the whole of this stupendous process of evolution is but a preparation for that true life of the spirit, which begins only when man becomes more than man. Humanity is the final class of the world-school, and, when a man passes out of this, he enters the life of the glorified Spirit, the life of the Christ. That life has a glory and a splendour beyond all comparison and all comprehension, : but the attainment of it by every one of us is an absolute certainty, from which we cannot escape even if we would. If we act selfishly, if we set ourselves against the current of evolution, we can delay our progress: but we cannot finally prevent it. There is thus a very close correspondence between the relationship of the Monad to the ego, and the ego to the personality. Just as the ego is for long ages the ensouling force of the personality, so there comes a time eventually when the ego himself becomes a vehicle, ensouled by the Monad, now fully active and awakened. All the manifold experiences of the ego, all the splendid qualities developed in him, all these pass into the Monad himself, and find there a vastly fuller realisation than even the ego could have given them. The question arises, does the Monad, in the case of the ordinary man, ever do anything which affects, or can affect, his personality down here? Such interference appears to be most unusual. The ego is trying on behalf of the Monad, to obtain perfect control of the personality, and to use it as an instrument, : but, because that object is not yet fully achieved, the Monad may well feel that the time has not yet come for him to intervene from his own level, and to bring the whole of his force to bear, when that which is already in action is more than strong enough for the required purpose. But, when the ego is already beginning to succeed, in his effort to manage his lower vehicles, then the Monad does sometimes intervene. [5/30/2015 8:20:11 PM] Thuan Thi Do: Vol. 1, Page 169 THE SEVEN BRANCHES OF THE TREE OF KNOWLEDGE. [5/30/2015 8:40:04 PM] Thuan Thi Do: Now both these things—the power to touch the Master and the Master's group, and the power to polarise himself in the causal body and touch the abstract levels—are definitely the result of meditation, and the earlier letters you have received from me will have made this clear. There is therefore no need to recapitulate the earlier imparted data, save to point out that by strenuous meditation, and the faculty of one-pointed application to the duty in hand (which is after all the fruit of meditation worked out in daily living) will come the increased faculty to hold steadily the higher vibration. Again and again would I reiterate the apparently simple truth, that only similarity of vibration will draw a man to the higher group to which he may belong, to the Master Who represents to him the Lord of His Ray, to the World Teacher Who administers to him the mysteries, to the One Initiator Who effects the final liberation, and to the centre within the Heavenly Man in Whose Body he finds a place. It is the working out of the Law of Attraction and Repulsion on all the planes that gathers the life divine out of the mineral kingdom, out of the vegetable and animal kingdoms, that draws the latent Deity from out of the limitations of the human kingdom, and affiliates the man  with his divine group. The same law effects his liberation from subtler forms that likewise bind, and blends him back into his animating source, the Lord of the Ray in Whose Body his Monad may be found. Therefore the work of the probationer is to attune his vibration to that of his Master, to purify his three lower bodies so that they form no hindrance to that contact, and so to dominate his lower mind that it is no longer a barrier to the downflow of light from the threefold Spirit. Thus he is permitted to touch that Triad and the group on the subplane of the higher mental to which he—by right and karma—-belongs. All this is brought about by meditation, and there is no other means for achieving these aims. 20. 20 Luận về lửa càn khôn Các câu hỏi mở đầu ................................................223 I. Liên hệ gì của Con với Mặt Trời ? .................................225 II. Sự tiến hoá là gì và nó nối tiếp như thế nào? ...............231 III. Tại sao Thái Dương hệ tiến hoá theo đường lối nhị nguyên ? .................................................................................. 237 IV. Tâm thức là gì và vị trí của nó trong hệ thống là gì?... 243 V. Có sự tương đồng trực tiếp giữa một Thái dương hệ, một hành tinh, một con người và một nguyên tử hay không ?...245 VI. Trạng thái trí tuệ là gì ? Ai là con của Trí Tuệ ? ....... 259 VII. Tại sao có sự tiến hoá theo chu kỳ ? ........................ 273 VIII. Tại sao có sự hiểu biết cả công truyền và bí truyền ?.. 285 IX. Mối liên hệ gì giữa: a/ 10 hệ thống- b/ 7 hành tinh thánh thiện- c/ 7 dãy trong một hệ thống – d/ 7 bầu hành tinh trong một dãy – e/ 7 cuộc tuần hoàn trên một bầu hành tinh – f/ 7 căn chủng và phụ chủng. Đoạn A - Bản chất của Manas hay là Trí Tuệ ...............308 I. Ba biểu lộ của trí tuệ ........................................308 II. Vài định nghĩa của Manas hay trí tuệ .....................309 1. Manas là nguyên khí thứ năm ................................309 2. Manas là điện .......................................310 3. Manas là cái tạo ra sự cố kết .......................................332 4. Manas là chìa khoá đưa đến giới thứ 5 trong thiên nhiên ..................................................................................................334 5. Manas là tổng hợp của 5 cung .................................. 336 6. Manas là Ý chí thông tuệ hay thiên ý của một Đấng 337 Đoạn B. Manas dưới hình thức một yếu tố vũ trụ, thái dương hệ và con người..
24. 24 Luận về lửa càn khôn d. Sự tái lâm sau này của Đấng Avatar ................747 e. Sự thôi thúc và sự luân hồi ...................................760 f. Hoạt động của các Pitris ...................................773 g. Công việc kiến tạo hình hài ...................................783 h. Luân hồi và Karma ..................................791 D. Về việc kiến tạo thể nguyên nhân ...........................807 a. Các nhận xét mở đầu ..................................807 b. Tiến hoá của các cánh hoa ..................................816 c. Các tên gọi của hoa sen chân ngã ........................840 d. Các cánh hoa và các trung tâm lực dĩ thái .........857 e. Điểm đạo và các cánh hoa ..................................868 4. Hoả tinh linh, các nhà kiến tạo thứ yếu ....................887 a. Mở đầu ................................887 b. Các tinh linh cõi trần ................................889 c. Tinh linh và các dĩ thái ................................910 d. Tinh linh và tiểu thiên địa..
28. CÁC ĐỊNH ĐỀ MỞ ĐẦU ((IINNTTRROODDUUCCTTOORRYY PPOOSSTTUULLAATTEESS)) Giảng huấn được đưa ra trong bộ “Luận Về Lửa Càn Khôn” này có thể được phát biểu trong các thuật ngữ sau. Các định đề này chỉ là các quãng diễn về ba điểm căn bản ở trong lời tựa của quyển I bộ Giáo Lý Bí Nhiệm (The Secret Doctrine) của bà H.P. Blavatsky. Đạo sinh được khuyến cáo nên nghiên cứu chúng một cách thận trọng; bằng cách đó, việc tìm hiểu của đạo sinh về bộ Luận này sẽ được trợ giúp rất nhiều. I. Có một Bản Nguyên Vô Hạn Bất Di Dịch (Boundless Immutable Principle); một Thực Tại Tuyệt Đối vốn có trước mọi Đấng biểu lộ hữu hạn. Bản Nguyên đó vượt ngoài tầm và phạm vi hiểu biết của bất luận ý tưởng hay cách diễn đạt nào của con người. Vũ trụ biểu lộ được chứa đựng trong Thực Tại Tuyệt Đối này và là một biểu tượng có hạn định của Thực Tại Tuyệt Đối đó. Trong toàn thể Vũ Trụ biểu lộ này, có ba trạng thái được nhận thức. 1. Vũ Trụ Thượng Đế Ngôi Một, vô ngã và vô hiện, có trước Vũ Trụ Biểu Lộ. 2. Vũ Trụ Thượng Đế Ngôi Hai, Tinh Thần -Vật Chất, Sự Sống, Tinh Thần của Vũ Trụ. 3. Vũ Trụ Thượng Đế Ngôi Ba, Thiên Ý Hồng Nguyên Vũ Trụ, Linh Hồn Vũ Trụ Đại Đồng. [5/30/2015 9:26:06 PM] Van Atman: b. The Law of Attraction...the law governing soul, the second aspect. c. The Law of Synthesis....the law governing spirit, or the first aspect. 4. Each of these Laws manifests primarily on one or other of the seven planes of the solar system. thức trong Thái dương hệ.